How to edit the existing Rule? How to Disable or Delete the Lead Scoring Rule? 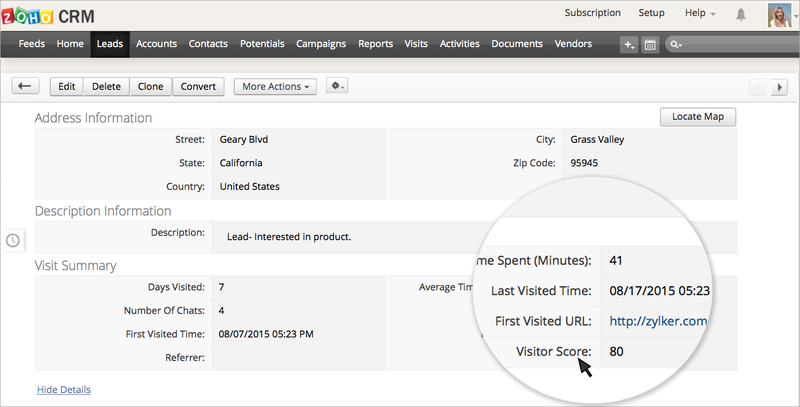 The score earned by the visitor during their visit to your website is called Lead Score. 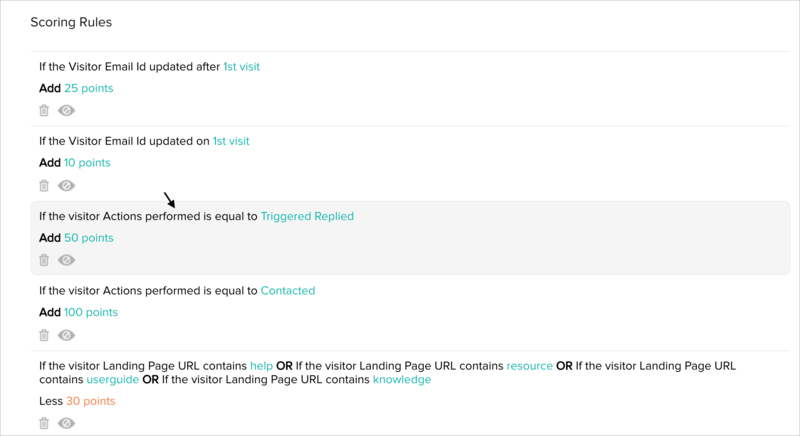 You can identify the type of visitor based on their Lead score. The higher the lead score in the Visitor history, the higher the probability of closing the deal. You can set various criteria to score your website visitors based on their actions on your website and the visitor’s value in the Zoho CRM. The lead score will calculate the score based on the rule you have set in your SalesIQ. In Settings -> Lead scoring, set a rule and allocate points for the defined condition. In the Scoring Rules, you can Add a new rule or click on the existing rule to edit the rule.Now to create a new rule, click on the Add button. 'Create Your Scoring Rules' window will then appear. Select a Condition from the drop-down. Then, enter a Value in the text box. For the chosen condition you can Add or Minus the points. Choose an option between Add and Minus, and then enter the points you would like to add or minus for the specific condition (ex: 15 points). Click on the Apply button to add your Lead Scoring rule. A default set of rules will be available in the Lead Scoring section. To edit the rule, click on the top of the rule. The 'Create your Scoring Rules window' will then appear. Now modify the rule and click on the Apply button to save changes. To delete the rule, click on the Delete(trash) icon that appears below the rule . And to disable the rule, click on the Disable(eye) icon that appears next to the Delete icon. You would like to add 25 points to the score of the visitor who spends more than 15 min on your website. Now choose the condition as “Time on site”, choose the criteria as “is more than” and enter the value as 15 min. Then, choose Add and enter 25 points. If the visitor’s Time on Site is more than 15 min, then 25 points will be credited to the visitors Lead Score. The score accumulated in the Lead score of the visitor will be recalculated based on the interval.This is done to reduce the lead score upon periods of inactivity. You can set the recalculating period of the lead score in the Advanced Configuration section of the “Lead Scoring”. In the “When would you like to recalculate the Lead Score?” choose an option from the drop-down. By default, it is set to Weekly. The score will be reduced by 25% from the current value for the interval specified. Daily - Score will reduce if the visitor doesn't turn up the next day. Weekly - Score will reduce after every 7 days. Bi-weekly- Score will reduce after every 14 days. Every 30 Days - Score will reduce after every 30 days. Every 90 days - Score will reduce after every 90 days. Every 180 days - Score will reduce after every 180 days. Yearly - Score will reduce after each year. The set condition is Add 25 points to the visitor, if the number of visit is more than 10, and also weekly option is chosen in the “When would you like to recalculate the Lead Score?”. 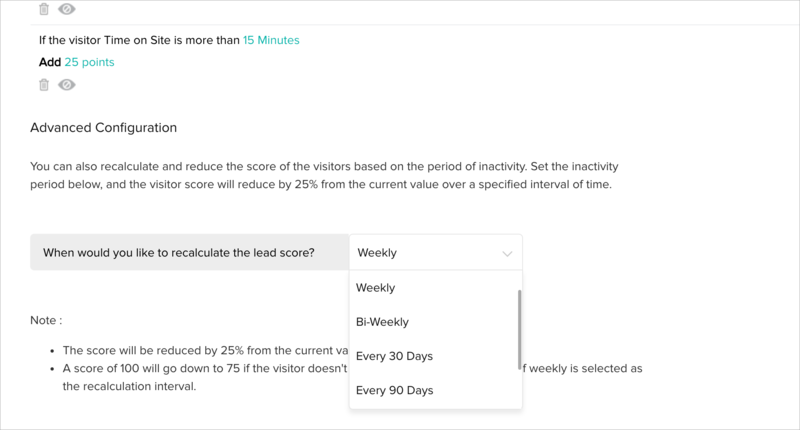 Assume that the visitor has a Lead score of 100, and he doesn’t turn up for a week, then the score of 100 will reduce by 25% from the current value. So, now the Lead score will become 75. You can view the Score of the website visitor in Zoho CRM. 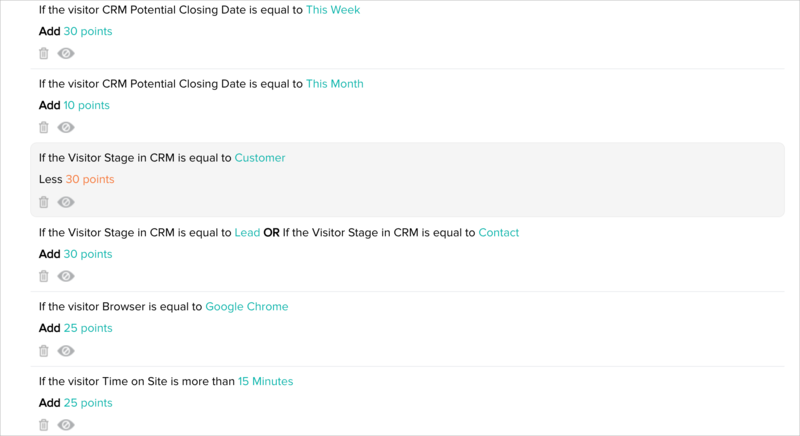 The Lead Score earned by each visitor will be pushed from SalesIQ to the Visitor Score field in the Visit – Summary of Zoho CRM. 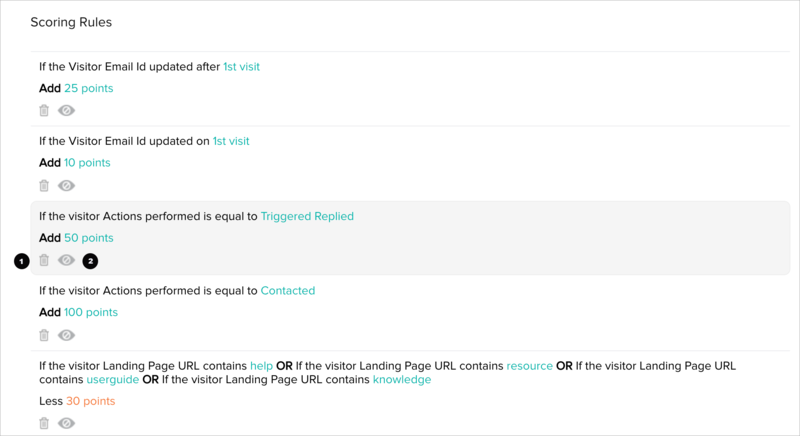 The Visitor Score field will be available in the Visit Summary section of Lead/Contact tab. This feature is applicable only if Zoho SalesIQ is integrated with Zoho CRM. The Visitor Score will be pushed to Zoho CRM only if the Identity of the visitor (Name & Email) is tracked in SalesIQ. SalesIQ intelligently identifies prospects and assigns a percentage value for the deal-closing probability. The opportunity calculation is based on the lead score of the visitor. The visitor with the maximum lead score will be given 99.9% and the visitor with the least lead score will be given 0.01% as opportunity percentage.